For some reason, people seen to think this looks harder than making lasagna the traditional, layered way, but I disagree. Not only does it look just about perfect, every time, you end up with perfectly sized portions. In fact, you can make this, freeze individual portions in Ziploc containers, and heat it up at work in the microwave. Better than those store-bought frozen dinners! Last year, my friend Laura Lee posted a mouth-watering picture on Facebook – this one, over at the left, as a matter of fact – for Mushroom-Kale Lasagna Rolls. Today’s lunch was a bit of a gamble, though, since about the only ingredients I had on hand were the lasagna noodles and a tub of ricotta. I didn’t feel like rushing out to the grocery store before lunch, either. I peered into the fridge and found the ricotta; some raw, baby spinach; an abundance of fresh basil; and about a tablespoon of Kraft grated parmesan cheese. In the pantry, next to the lasagna noodles, I had an unopened jar of Classico Tomato Basil pasta sauce. This might have been better with some shredded Italian cheeses or mozzarella, but it’s a fairly forgiving process. I nixed the idea of grating sharp chedder or jalapeño jack over the top, and hoped that the ricotta and Parmesan would be enough. As it turned out, it was – and even my son, who probably wouldn’t touch the mushroom-kale roll-ups on a dare, liked it. Boil lasagna noodles per package directions. Pour about half of a jar of pasta sauce in the bottom of a Pyrex baking pan and spread it around to coat. Chop spinach and basil together. Mix spinach and basil with 15 oz. ricotta. Season mixture with oregano, thyme, or other herbs to taste. Remove noodles from boiling water, and carefully lay flat on baking parchment or foil. Spread an even amount of ricotta-spinach-basil mixture on top of each noodle to cover the entire length. Drizzle a stripe of pasta sauce down the length of each noodle. Gently roll each noodle, lifting as you roll – there’s no need to roll it up tightly. 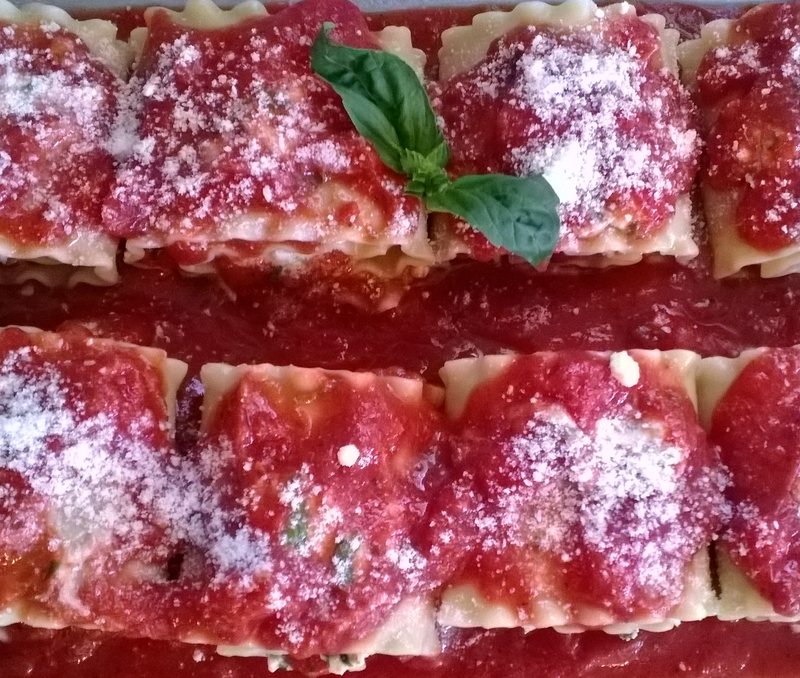 Carefully lift each lasagna roll and place it in the baking pan atop the pasta sauce. Spoon sauce over lasagna rolls and sprinkle with Parmesan cheese. Cover the pan with aluminum foil, and bake at 375F for 30 minutes. Remove from oven, lift off foil, and let stand for 5 minutes before serving. Will that suffice? Neat idea though! So easy, and so tasty – you should try it, Pete! I would have to make some for Noella, Dan, and I. Ron cannot do the tomatoes, and too much pasta upsets his widdle tummy! Could you make it with an alfredo sauce? And what’s “too much”? Each roll-up is only one lasagna noodle. You could get the gluten free kind and try it! Or maybe a nice pesto sauce! That might be good. My cooking skills are not up to Alfredo or Pesto, sadly! Silly man… buy some in a JAR. Holly buys stuff in a jar? Yes, I might try that! Did you know Homer, my brother? Homer will be jealous! But hey, I can see why yuo like me better! “You wised up fast!” HA HA ! I hope you did not get a speeding ticket. No speeding ticket. 😉 But it certainly made my life easier. Just glad he clued me in before I attempted to make filo pastry from scratch.